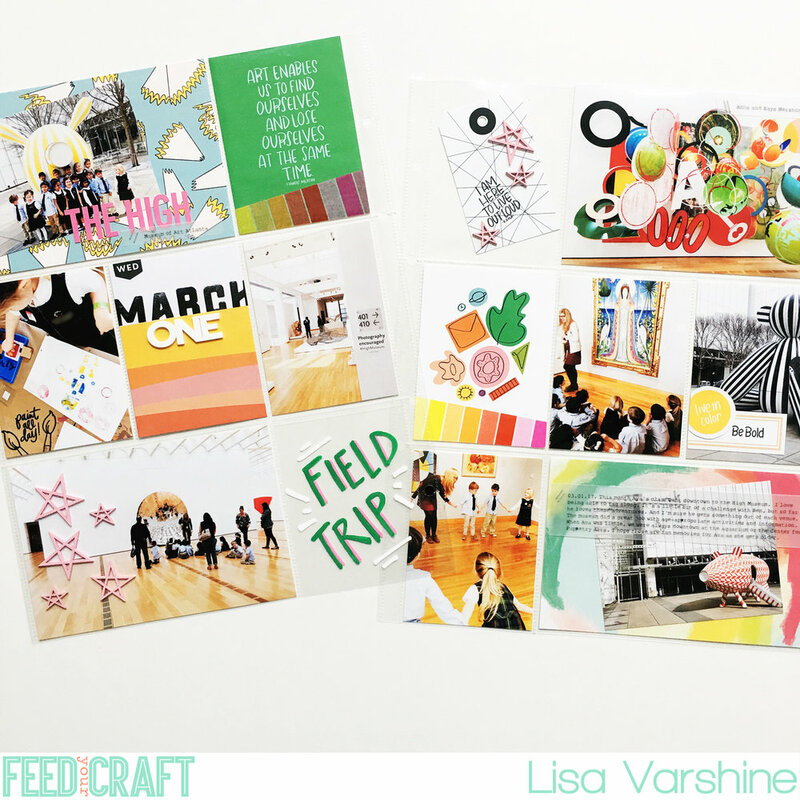 This month's Make it Matter kit from Feed Your Craft is home run. They usually are. In fact, I am still bitter about the last kit selling out (Hint, hint. Is there a secret stash somewhere?) Anyway, the maker theme had me giddy with ideas. 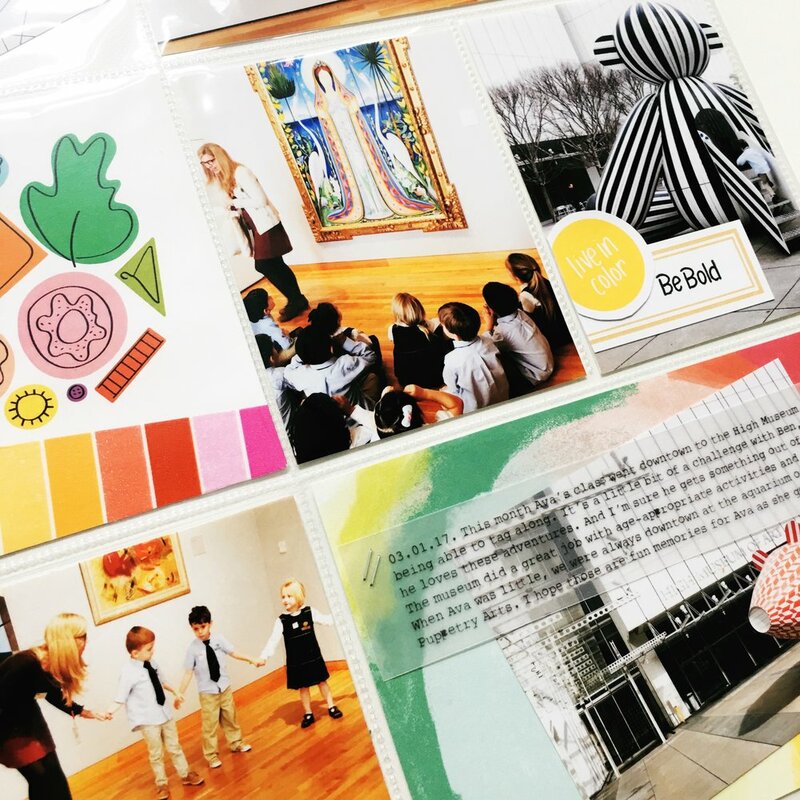 First up, Ava's class field trip to the High Museum of Art. Each month is a different venue, and this one was my favorite. Starting with the left side, I used the pencil shavings 4x6 card. I attached a little group shot with the tiny attacher and labeled it with an old pink alpha sticker set from A Beautiful Mess. The green art enables card was an obvious choice. I added a quick bit of washi at the bottom (from Studio Calico, old documenter kit) for more color. The kit's paint all day stamp was a perfect fit for the kid's hands-on projects. 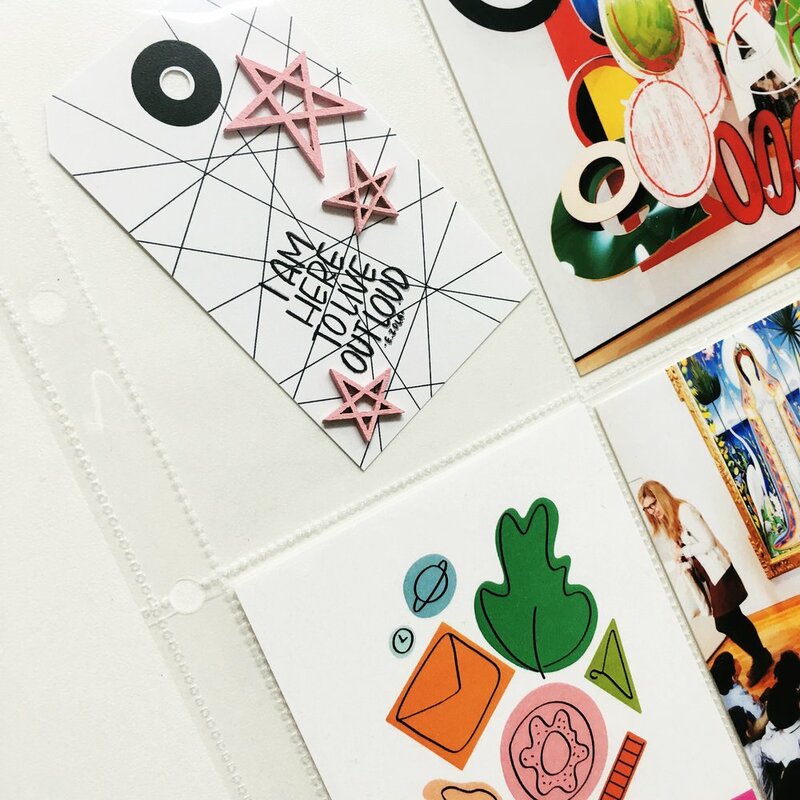 The middle card is a printable included with the kit. I stamped the month with the Feed Your Craft Rustic Alphabet Stamp Set and masked a small portion of the letters to fade into the beautiful yellow on the card. The bottom left photo is embellished with a few pink stars (recent Studio Calico kit). Bottom right is just a quick doodle with Uni Posca paint markers on ink jet transparency. The right side starts with a tag from Feed Your Craft's This Week flat pack (check out my full layout using that pack on instagram--the included digital files will be on serious repeat), the live out loud stamp and a few more pink stars. Next, another beautiful card by Brandi Kincaid, accented with the same washi. Middle right photo is embellished with one of the kit's labels, a cute printable and the be bold stamp. To finish the spread, I included another picture and journaling on vellum (my favorite thing, apparently) on Pink Paislee Fancy Free paper. I'm really enjoying this kit and can't wait to share more of my Make it Matter projects.